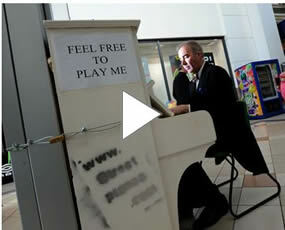 Street pianos are appearing in cities across the world. Located in skate parks, industrial estates, laundrettes, precincts, bus shelters and train stations, outside pubs and football grounds, the pianos are for any member of the public to enjoy and claim ownership of. An arts project by Luke Jerram ‘Play Me I’m Yours” questions the ownership and rules of public space; it is a provocation, inviting the public to engage with, activate and take ownership of their urban environment. The first pianos appeared in March 2008 when 15 pianos were placed into the streets of Birmingham UK. This website – www.streetpianos.com – was made for the public to post their comments about the pianos and describe their use. The site has helped document each piano’s journey whilst connecting the street pianos and their communities across the city. Presented for the City of London Festival and Sing London, 30 street pianos were installed on streets, in public squares and parks, train stations, and markets. Like a creative blank canvas, the pianos were there for any member of the public to play and engage with. The pianos were in place for three weeks, after which time they were be donated to local schools and community groups. Play Me, I’m Yours has toured since 2008.